A different kind of granola made with unique plants and no added sugar. A small amount keeps your satisfied for longer. 24% tigernuts, apples*, dates*, 10% sea buckthorn powder*, sprouted buckwheat*, pumpkin seeds*, raisins*, 3% aronia powder*, linseeds*, sunflower seeds*, sea salt. *Certified organic. This product may contain traces of nuts, sesame, mustard seeds, soy and celery. Our signature granola recipe contains no added sugar and is naturally free from gluten. Tigernut – the key ingredient in this recipe – is a sweet veggie root rich in iron, magnesium and fiber. Tigernuts have prebiotic properties. In other words, they promote the gut microflora and help to keep your digestive system in check. Just like tigernut is not a nut, buckwheat is not a wheat but a seed that is naturally gluten-free. It’s a source of magnesium, iron and B vitamins. Sprouting buckwheat makes it even easier for your body to digest. It also increases the amount of nutrients and helps buckwheat form co-enzyme Q10. Sea buckthorn berries are rich in rare omega-7 fatty acids and beta-carotene, while aronia berries are high in anthocyanins. This powerful duo is great for a healthy heart and glowing skin. 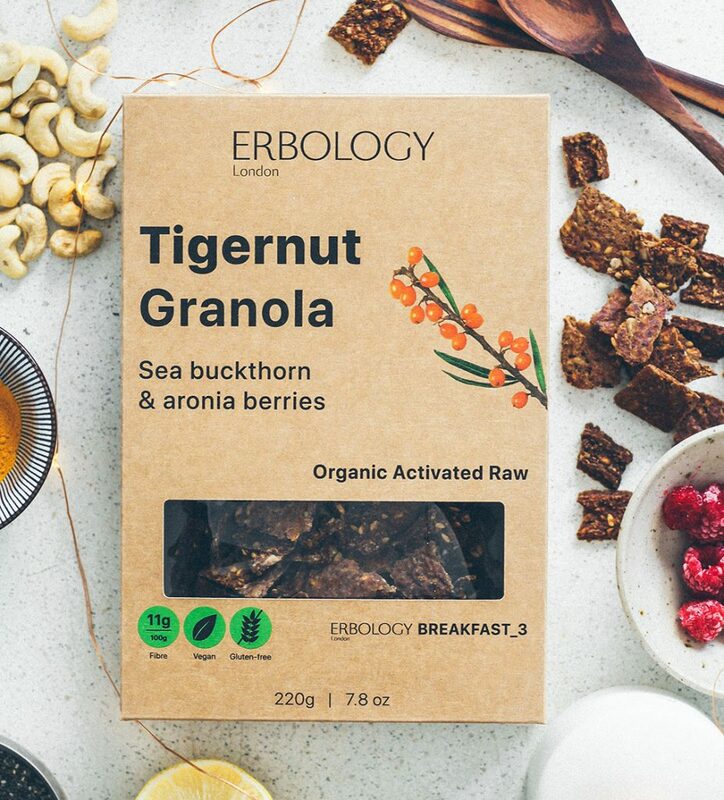 Erbology granola contains no added sugar and is delicious plain or topped with yogurt or milk. Sea buckthorn berries make it slightly tangy, while dates add a pleasant sweetness and make it chewy. Soak 2 cups cashews for 2-4 hours. Prep your turmeric chia pudding: Combine 3 1/2 cups coconut milk with 1/4 cup chia seeds, whisk together and then let rest, stirring occasionally. When the pudding is hard enough, add 3 tbsp agave nectar or maple syrup, 1 tsp turmeric powder, zest from 1 lemon and a pinch cinnamon and salt. Set aside. Prep your wild berry chia pudding: Combine 3 1/2 cups coconut milk with 1/4 cup chia seeds, whisk together and then let rest, stirring occasionally. When the pudding is hard enough, add 3 tbsp agave nectar or maple syrup, zest from 1 lemon, 2 drops vanilla extract and a pinch of salt. Then add 1/2 cup berries (fresh or frozen) and mash into pudding until it is well blended and has a nice pink color. Set aside. 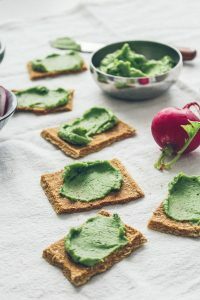 Cashew vanilla cream layer: Place your soaked cashews in a blender with 2 cups coconut milk, 1/4 cup agave nectar or maple syrup, juice from 1 lemon, 3-4 drops vanilla extract and a pinch of salt. Blend well until it becomes smooth enough. Set aside. 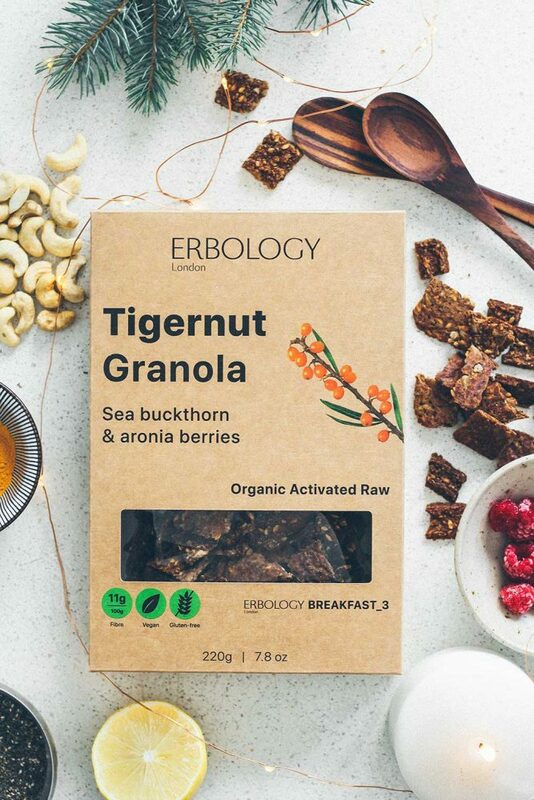 To assemble, you will need 1 cup fresh or frozen berries and as much Erbology Organic Tigernut Granola with Sea Buckthorn as you would like. 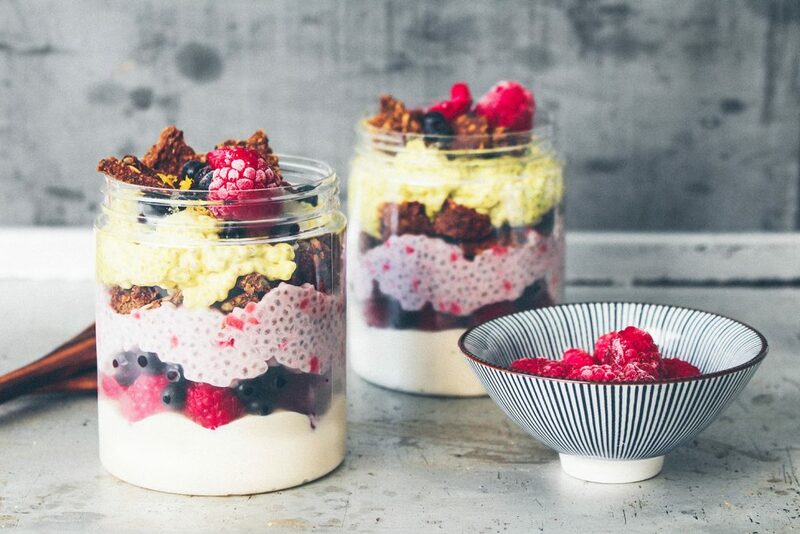 Now layer your puddings and cashew vanilla cream with berries and granola. Arrange in any order and enjoy.